I wracked up some decent mileage over the last three days averaging about 4.5 miles per run. Two of these runs were a bit harder because of the heat, humidity and hill challenges. Today I decided to be kind to myself and go out early through the neighborhood and enjoy the mostly flat topography without thinking too much about pace. I started out feeling energetic and wondered how long it would be until the first feelings of fatigue would set in. After almost a year I still hit the wall around 3-4 miles but I always manage to keep going. Most of my weekend runs range between 3.1 and 6 miles although I have run longer than that on occasion. Of course 4.5 miles on a soft trail surface with tricky switchbacks and sharp elevations is not the same as running a flat road course of the same distance. I felt good about all three runs I've competed since Friday. Today was about putting some additional distance in and I planned to follow a straightforward course that took me around neighborhood #2 and looped around my main neighborhood along the outside roads. For the most part this was a simple flat run but at the 33 minute mark I faced the big hill on Jericho Turnpike that increases elevation by about 25 feet over a tenth of a mile or so. For some reason this hill never seems as bad when running it as it does when viewed from the road and I managed to get up and over without a problem. 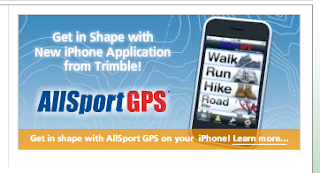 I used the AllSport GPS app on my iPhone today and it worked well but, like MotionX, iMapMyRun and Runkeeper, it suffers from the lack of precision with GPS. The Allsport did come within 1% of my actual distance of 4.64 miles (the Garmin did slightly better than Allsport) when compared to a hand mapped route on Google Earth. The Allsport interface is quite nice though and their website provides some nice mapping and metrics of your activities. Almost everything you'd want for $10 except accuracy! One feature it lacks is the capability to play the iPod app while tracking your run. MotionX, at $2.99, is a better choice in that case. This weekend has been fun with friends and lots of good meals that led to some over indulgence. I'll take today as a reset to get back to my rational eating habits. My son and I are going to see the G.I. Joe movie today so my discipline will be tested by the bucket of popcorn he will invariably request. Well I guess when you're training there is no such thing as bad carbs. A trail marked "UH OH"
Who says GPS is more accurate than a foot pod?